The city of Barcelona is filled with cultural attractions. Located in the northeastern region of Catalonia in Spain, the seaside city is suited for backpackers, families and visitors on a city break. There are many national and international flights at comfortable times to the city’s El Prat airport, and there is a high speed rail service that connects Barcelona to Madrid. There are many parks and large spaces where families will be able to spend an afternoon. The centric Ciutadella park is more than just a park. There are several museums located on the parks grounds, including the Martorell Museum and the Laboratory of Nature, which houses many exhibits from the Natural History Museum’s collections. Another one of the park’s main attractions is the lake located in the center of the park. Families will be able to rent boats and row around the lake. After a walk around the park families can visit the zoo, which is located in the park. Another famous park is Parc Güell. This park, located slightly farther away from the city center, was designed by Gaudí. Gaudí’s colourful designs and wavy shapes can be seen around the park, from the cavernous porch held up by thin bony columns to the tiled observation deck decorated with a mosaic bench that has views towards the city and the sea. Barcelona is a city that can be explored on foot, and places farther away from the city center can be reached by public transit. Las Ramblas is a set of connected boulevards that were built on the site of an ancient stream that used to flow around the city. The Rambla de Canaletes is one of the main streets, where visitors will find an historical fountain. 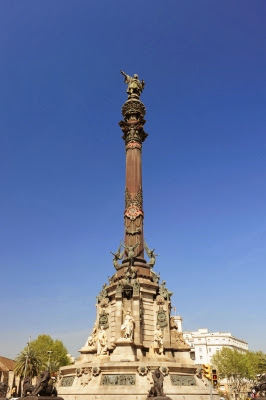 Las Ramblas cover the distance between the centric Catalonia Square and the Columbus statue located by the sea. Each one of the boulevards is filled with colorful flower stalls, kiosks and street performers. Just off Las Ramblas visitors will find the Boquería market, a famous market. Visitors can enjoy one of the natural juices sold at the market, a colourful granizado iced drink and some authentic pan tumaca bread served with olive oil and freshly ground tomato. There are many stalls selling fresh and local products, and the market has a bakery and several stalls selling honey and nuts. In the nearby streets there are many restaurants where even the pickiest children will be able to enjoy a fresh meal made using local ingredients. Some of the city’s most famous seafood restaurants are located near the Barceloneta beach. The city’s aquarium is located near this beach in the Port Vell area, where families will be able to see many exotic fish. Another way to explore Barcelona with children is by enjoying a trip on one of the touristic hop on hop off double decker buses that travel around the city’s main landmarks. There are three routes around the city, including an historical route and a sports route that takes visitors around the area where the Olympic Games were held and the Camp Nou stadium, the stadium of Barcelona’s football club. During the bus ride visitors will be able to see the city’s main architectural landmarks. Gaudí’s Sagrada Familia cathedral is one of the city’s most famous monuments. The unfinished Cathedral of the Holy Family has several carved facades decorated with statues and towers. Visitors can climb up hundreds of steps to reach the top of two of the towers, from where they will be able to enjoy views towards the city. There sure are a lot of interesting places to see and enjoyable things to do when you visit Barcelona that I hope I can visit the place with my little man one day. I will make sure to include the local Post Office in my itinerary and hunt for Barcelona 1992 Olympics memorabilia while I am there. Oh, and I won’t forget riding one of those double deckers, am sure Jared will be thrilled! This entry was posted in travel and tagged destination, Spain, travel tips on January 17, 2014 by Mum Travels. Great photos and wonderful article. I am totally checking out this place so I can add this to our upcoming travel list. I look forward to visit Barcelona someday. Lovely photos and so helpful since I’m sure a lot of people will be traveling again now that the holiday season is over. One of the places I would love to visit someday.. also Madrid. I wish I could enjoy the beauty of Barcelona with my family someday.